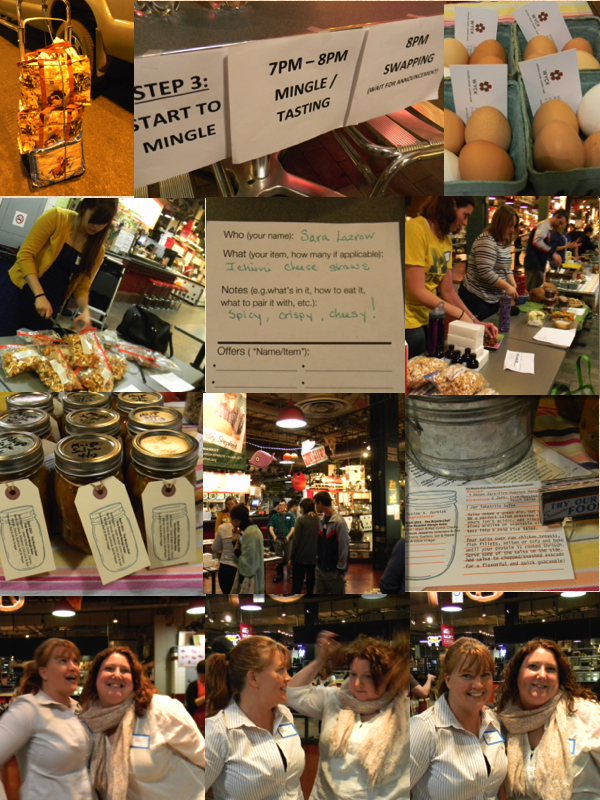 Philly Food Swappers Event at Reading Terminal Market - The Set Up! Bottom row- Besties, Pam & Sam as they readied for thier close-up! A food swapping community in the Philadelphia area. Bringing the foodie community together and increasing self sufficiency. Do you love food? Do you make food? Do you want to get new tasty things? Do you live in the Philadelphia area? Food swaps are popping up all over the world and now Philly has one! 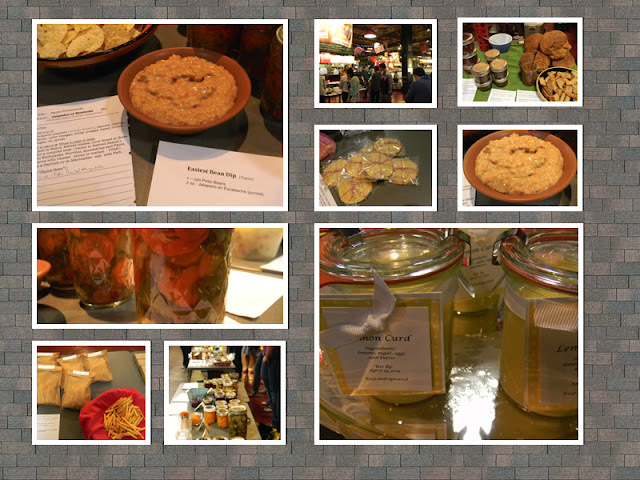 Join our community to make and exchange homemade or homegrown food items (preserved fruits and veggies, pickles, jams, jellies, salsas, vinegars, cheeses, breads, cookies, cakes, honey, granola, homegrown herbs and vegetables, backyard eggs, soups, spreads...you get the picture). 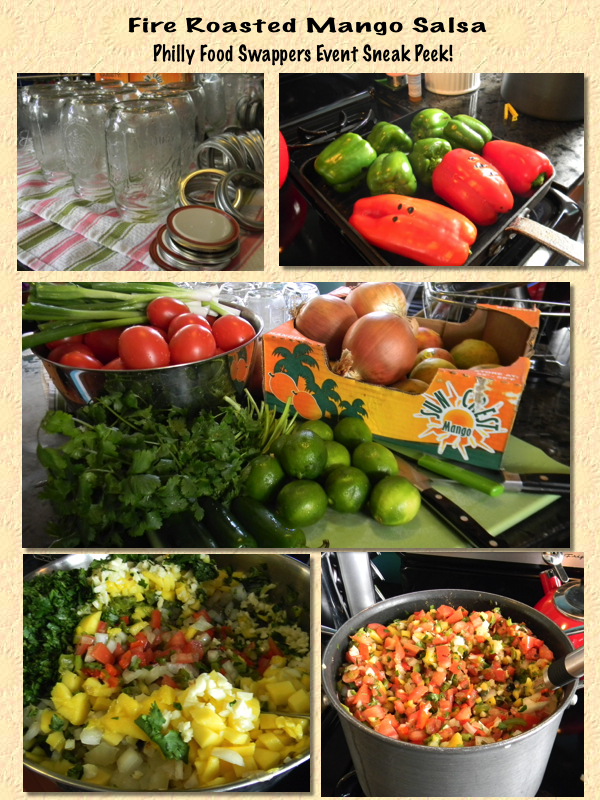 My sneak peek photo montage of my salsa canning in action! What to make? What to bring? Will they like my stuff? Should I bring a lot of different food items or should I just make one foodstuff? So many questions. I worried about this for a month! And when it came time to actually get to making my decision, I was stumped. I had about 5 jars of canned salsa from the summer. 3 or 4 jars of my balsamic and onion fig jam. 2 small jars of the roasted caramel applesauce. Not enough of any one product to swap and share and most were already 6 months old. I decided to stick to what I do best and make a salsa. Which took me on an hour long drive to find Produce Junction, then to another store to buy cilantro, scallions and canning jars. Nearly $50 into the project, along with 6 hours of prep time, I was ready for my first food swap with 12 pint jars of Fire-Roasted Mango Salsa. I armed myself with my recipe newsletters, salsa samples, chips, business cards and an assortment of other props. Thank goodness I had a rolling cart/dolly to load up so I could carry all of my equipment! 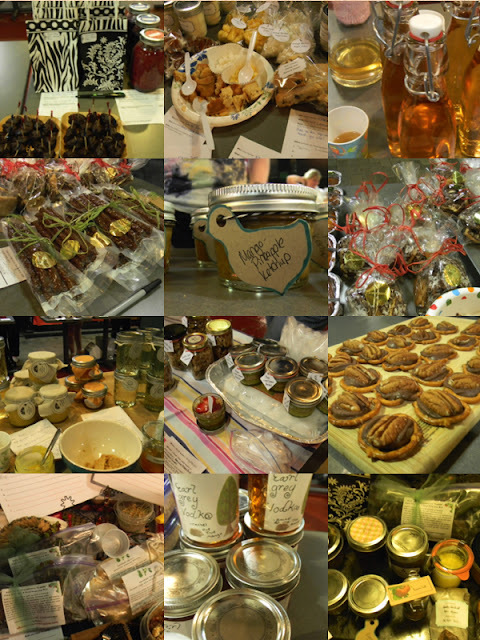 Many varied and beautiful foods at the swap - pesto, extracts, macaroons. The event was scheduled to start at 7 pm. I arrived at 6:30 and when I got to the Reading Terminal Market, there were already more than 30 swappers there, setting out their good. The Market was buzzing with anticipation and excitement. I was glad I arrived early as the spot I got was in a "prime location". I was also set up with some lovely people with amazing products - Raw Lime Cream Parfaits and Granola from Nancy; Year-long fermented and home-made Chick Pea Miso, Fresh Eggs, and pickled radishes by Wyck Farms in Germantown. I worried that I had too many props for my table and that my salsa wouldn't go over very well. Silly me! More beautiful foods - there were home-made Pop Tarts and breads, pickles and dips. After I set up my table, I began to wander about, sampling and talking to the other swappers. I met an eclectic and welcoming bunch of people. Stand outs of the friendly folks I met were Carly, who had an orange marmalade jam made with brown sugar - a taste revelation. The brown sugar cut through the bitterness of the orange peel and turned the jam into a sweet and caramelized treat. I met besties - Pam and Sam. Pam had these amazing caramelized balsamic pearl onions and Sam had chive pesto, along with a gorgeous bunch of chives about to blossom. They were good sports about letting me take their photos and were both very encouraging about how the swap works and my offerings. Nancy - the lady with whom I shared table space was most informative and helpful. Plus her Raw Lime Cream Parfait was to die for! There was also Sara May, of The Cozy Herbivore. She was the sweetest, most endearing person I met the whole night. And everyone I met was absolutely lovely so that's saying something. We talked at length about kids, partners and making big life changes. We barely talked about our foodstuffs and I barely got to ask her what she does outside of the food swapping world. Little did I know that Ms. Sara is even more talented and famous than I could have guessed. She works at Franklin Fountain in Olde City and is responsible for creating new fountain drinks, potions and concoctions. It's funny to me to talk to people and have no idea who they are or what they do and connect over our shared love of creating new foodstuffs. Food Offerings over-view and my haul at the bottom right! After an hour or so of mingling and sampling, the next wave of fun begins - the swap. Now, during the first hour's meet, great and tasting, you are to write down on a swappers food card that you are interested in swapping what you have with them for their item. I made the rounds three or four times checking out items I wanted and trying hard to not look at my card out of fear that no one wanted my salsa. There were infused Vodkas, Limoncello's and other boozy treats; Jerky, cakes, cupcakes, cookies and krauts. The variety of home-made goods was astounding. Salad in a jar, soups, eggs! I talked with more swappers, circled back to talk to my friend, Natanya (and to sample her unforgettable and velvety smooth lemon curd in the most beautiful William-Somoma jars I've ever seen!) My list of desired items was growing long and I needed to keep it to about a dozen items, to fairly trade for my dozen jars of Fire-Roasted Mango Salsa. My anxiety was completely unnecessary - my dance card was full! The sign-up sheet for my salsa was filled with people clamoring to trade! At first I took whatever came my way, even if I didn't want the items (all were fabulous by the way). As the trading went along, I realized I had a choice in saying no if I really didn't want an item. As I got down to my last 4 jars of salsa and reached into my reserves of the other salsas I brought (this summer's Fire-Roasted Peach and my Tomatillo salsa) I got a bit more discerning. While I missed out on some great items (that awesome Chive Pesto of Sam's) and the Orange Marmalade with Brown Sugar swapper didn't quite like the kick in my salsa, the food items exchanged were varied and tasty. The haul I took home was (list somewhat incomplete due to memory loss!) - Nancy's Raw Lime Cream Parfait (eaten within an hour of getting home! ); Tomato Salt; Natanya's Velvety Lemon Curd; Vegan Squash Soup; Vegan Black Bean Brownie Bites; The Chick Pea Miso; Sara's Mango Pineapple Ketchup (she traded me what was left of her sample, hers swapped out very quickly); A most unusual and fabulous Strawberry Jam with Black Pepper (another taste revelation! ); Hot Pepper Jam (so good and I usually don't enjoy pepper jams); A bag of Strawberry Plant Roots to plant; 2 quick breads (which I have stashed in the freezer for another time); and the Balsamic Caramelized Pearl Onions. The last and best trade I made of the night was for this red pepper pesto hummus that is so delicious that you could drink the entire container and want more. The event was the Philly Food Swappers largest event held to date - over 70 participants. It was fun, exciting but never manic or over-whelming. The hour to mingle and sample was a great idea, it gave people a chance to really talk and learn about each other. The swap went so quickly but was well-run and never felt crazy or frenetic. I cannot wait to attend another and I'm even thinking (and actively planning) to do a similar but scaled down event in Collingswood where the moms and families I know could trade not only foodstuffs but home-made lotions, potions and other body-type products. If I am fortunate enough to get in the next registration, I am going to bring a wider but contained variety of items that I make best - maybe my sweet & spicy mixed nuts; seasoning blends; my roasted apple sauce. 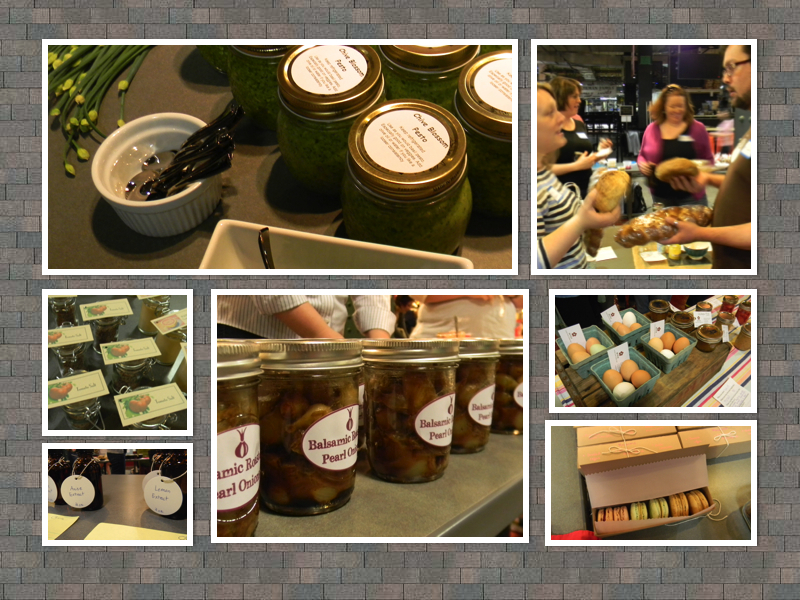 Farmers Market weekends are approaching - time to start planning and canning! Wow, this sounds so cool!!! I've never heard of anything like it. I'd be nervous too but it sounds like it went really well for you! Mary Ellen, it was a lot of fun, and yes, a bit anxiety producing. As one of my sensible friends said to me, you don't have to strive for perfection! Which of course, I did. I made a recipe, ingredient and tip-sheet "newsletter"; I brought things to lay out; business cards. I made fancy labels for EVERYTHING! I had a tablecloth for the whole row! Yeah, I do it up big! There was nothing to be nervous about, though that's the nature of us. I hope you can join in on one, I"m sure you would make beautiful products. Check out their facebook page - and btw, if you have one, let me know and if you haven't, check out mine too! loved tasting your salsa, wish I had gotten to swap with you. Hopefully next time! Thank you! What a wonderful thing to read and I'm sorry we didn't trade. I hope I'll have the chance to return to the next one - with the produce season coming upon us, I plan to can lots of salsas all season! I'm just getting around to reading this-- thank you so much for your kind words! And I really, really enjoyed our conversation. It's so nice to meet someone who is so instantly relatable. I have to tell you-- I really had to fight for your salsa at home! My girlfriend loved it so much she practically ate the whole jar before I wrestled it out of her hands. It was seriously gone in 2 days. Thank you so much, hope to see you again soon! Sara! I've been wanting to write to you, about all sorts of things, foodie related, mango pineapple ketchup related, Franklin Fountain related and whatnot! How funny about you and your girlfriend. Tell you what - I'll trade you more for your ketchup? I loved the ketchup so much and as you posted on your blog, it doesn't last long it's that good! I used it on chicken breasts and on baked tilapia. Glad you posted the recipe, I'll be making it soon enough! Hope to see you here there and everywhere! Thanks for stopping by to comment too! Holy crap...that's me! It was great meeting you and I agree that it was a wonderful event. I can't wait for the next one. SAM!!!! So nice you found me and the blog - adn that you want to start blogging again. I had the nicest night at the event, but meeting you and Pam, along with Sara were the high lights for me - truly! I was so inspired by the event that I am actually having a food swap at my house next Tuesday! If you are free and would like to come, email me and I'll give you the address and details. I live in Collingswood, NJ We're having it tuesday the 21st 7 pm to 9 pm - BYOB too. Denine...I'm not quite sure how to find your email address but thank you and I would love to attend your food swap. An evening of new people sounds great. Would it be okay if I bring Pam with me? Please feel free to email me at sjohutcherson@gmail.com. Sam - just sent you an email!